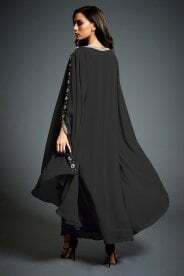 An elegant, handmade kaftan dress in black. Embellished with embroidery and crystals around the neck and sleeves, and featuring a tie belt to give a more fitted look. Ideal to wear on any occasion like cocktail parties, engagement parties and birthday parties.